I know I said I was done with Convergence last week. And yet, I felt compelled to give the Green Arrow tie-in a shot. Not just because it's Green Arrow but because I wanted to see how Christy Marx - who authored the excellent Conquests Of The Longbow adventure game - wrote my favorite Robin Hood inspired hero. Elsewhere in Metropolis, a young monk named Connor Hawke also fights to protect the weak and helpless from a new gang - the racist Brothers Of Purity. 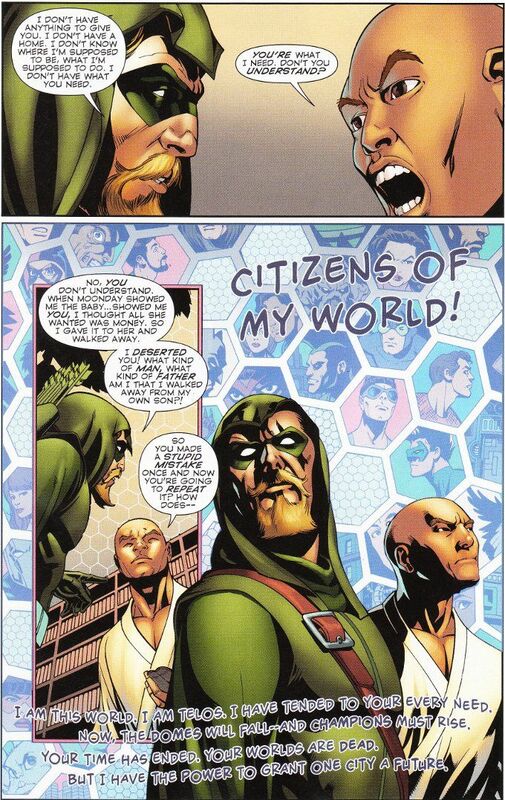 Hawke is something of a Green Arrow fanboy and is overjoyed when he finds evidence that his hero is in Metropolis. When circumstances force the two men together, a dark secret will be revealed - that Connor Hawke is Oliver Queen's long-lost son! 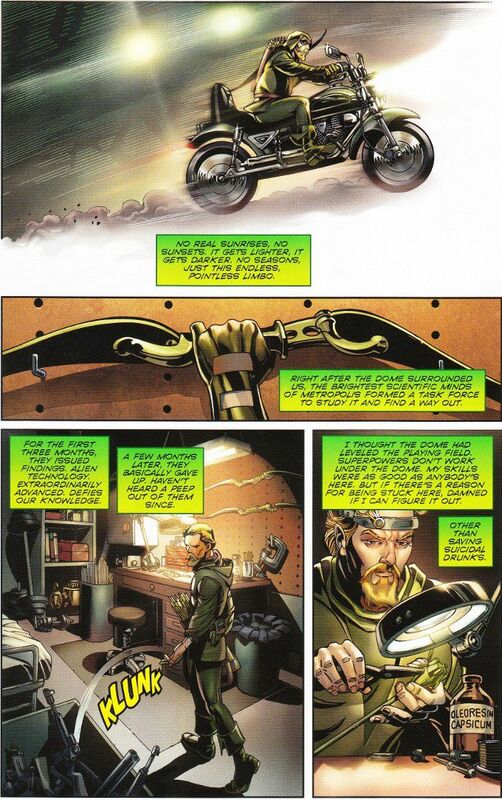 Marx spins a wonderful Elseworlds tale here about how Oliver and Connor might have met under decidedly different circumstances. Both characters are written true to form, with subtle nods in the script and artwork pointing to hidden sides of both characters. For instance, I loved seeing Ollie crafting a trick arrow, as many writers rarely depict Ollie as being capable of making his own arrows and forget that Ollie was an amazing engineer when it came to weapon design back in the day. 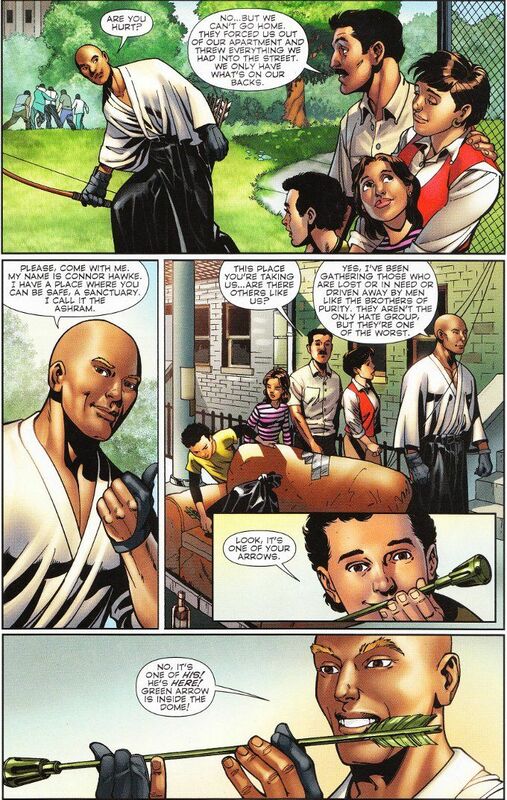 The only real flaw with the script - and I can't fault Marx for it - is a subplot built around the idea originally proposed by Brad Meltzer in The Archer's Quest that Oliver Queen was a deadbeat dad who knew about Connor years before the two met. I've gone into the general impossibility of this conceit elsewhere so I won't repeat that rant here. Suffice it to say this storyline adds nothing to the larger narrative, existing only to create artificial tension before the action truly begins. The artwork for the issue is generally good, though there are a few oddities. Rags Morales has been a favorite of mine since his run on Hawkman though some of his pages here seem rushed and I'm not sure Claude St. Aubin's inking style is a good match for Morales' pencils. And the color art by Neil Ruffino is uneven, with the shirt sleeves of Ollie's costume alternating in whether or not they match his jerkin.